One of the last projects to be completed was the inside trim on the front entrance. There were a couple of factors driving this. For one, we had planned on installing a sidelight to improve the appearance. But because of the house’s post and beam framing and the location of the door, we couldn’t just buy a door-sidelight combination. We had to custom-build the sidelight. The finished front entrance. The casings on the side were "milled" by hand from clear 1x pine stock using a combination of router bits, hand plane and belt sander. The pediment on top was built with 5/4 pine. 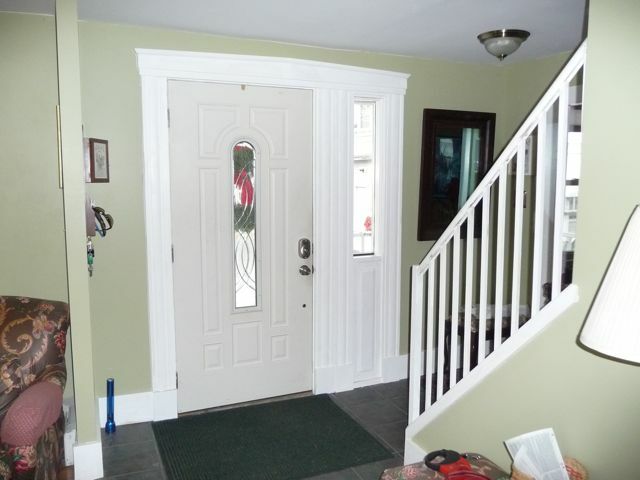 And along with that, we wanted to match the trim in the rest of the living room into which the door opened. Unlike the majority of the house, that room had an elaborate trim pattern, something Greek Revivalish that featured columnar-style casing on the side topped by a pediment (I think those are the correct terms). This was nothing I was going to find at Home Depot and nothing I wanted to pay to have recreated. So I figured I’d do it myself, once I figured out how. Once I got a workshop built in the basement, I started to tackle the entrance. First I built the sidelight, which wasn’t all that complicated. A frame, enclosing a piece of insulated tempered glass and a solid panel underneath. Then the trim. I was able to recreate by hand using a combination of passes with different router bits, a significant amount of hand planing and judicious use of my belt sander to create a nice curve between the column flutes. Nothing that would ever be featured on The Old House, but it worked and you can see the results.